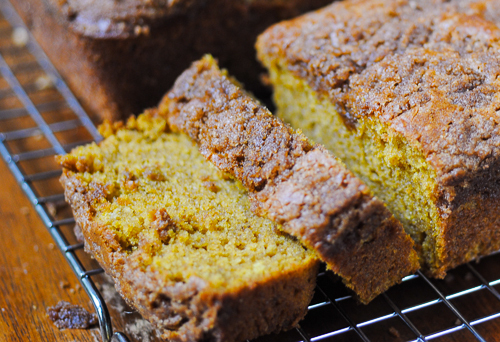 Ugh, I hate when I make something so delicious as this pumpkin bread, sometimes. It’s just too, too much for one little body. But when the leaves start to shift from green to gold — yes, even here in New York City — and I can no longer wear flipflops when walking Mitra in the mornings (sniff), my thoughts turn to pumpkins and squash and apples with such a force that recipes like this get penciled in my day between interviews and rough drafts and number crunching, or whatever it is the day may hold. So, when my thoughts turn to pumpkin, I turn to Cooks Illustrated and America’s Test Kitchen. If you’re new to the world of gluten-free baking… and if you’re an old salt, too, now that I think of it… I can’t recommend using Cook’s Illustrated as a reference more. I love how they’ve detailed out the stories behind the recipe, so you know what worked and why, and what didn’t. They’re also impeccable in giving ingredients in weights, which I find invaluable with gluten-free adaptations. If you don’t have a scale, I highly recommend you get one. All of my recipes (well, 95% or so) are weighed primarily, the measurements what the equivalent was when I scooped or poured that test. Measurements are inaccurate. Weight is reliable. So, for the flour blend in this recipe, I used millet flour for its delicate crumb and slightly sweet texture, quinoa for its protein power and nuttiness, and brown rice flour for my bulk. Tapioca starch helped to bind it all together, and just enough xanthan gum pulled it in with a bit of volume. Use these if you have them, or the equivalence in weight of what you’ve got, knowing that our versions may be slightly different. Here’s why I love this particular recipe: the Cook’s Illustrated recipe I based this on suggests cooking down the pumpkin to rid it of its metallic flavor from being canned. And, yeah, it did that. But it also concentrated the pumpkin flavor with the spices a bit as it came up to a pop, and then made mixing in butter (which did not have to be at any particular temperature to begin with) and sugar a cinch: raw turbinado or coconut sugars will be evenly distributed and blended in this recipe. I opted for just using butter and almond milk instead of cream cheese and oil, to keep the milk solid/proteins down (I can’t do anything above a bit of butter) and avoid any processed oils. 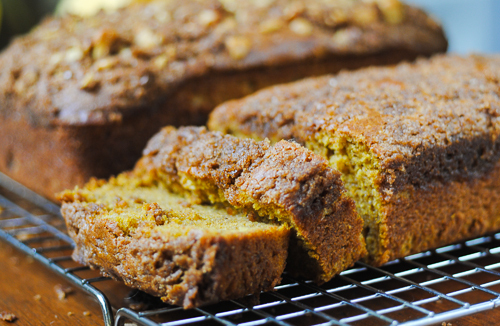 When cooled and ready for noshing, this bread is fragrant, rich in pumpkin flavor, slightly spiced, and incredibly moist. It makes two large loaves and would be smashing for miniature loaves for gifting during the holidays, as my elder sister often makes. I did one loaf with toasted walnuts, and could see cranberries, chocolate chips or dried fruit working swimmingly as well. Preheat oven to 350°. Grease two 8″ loaf pans and set aside. While the oven is preheating, place walnuts on a quarter sheet tray and toast in oven. As soon as you smell them getting toasty, pull them out. Walnuts will go from raw to scorched within seconds, but they’re so much better freshly toasted. You’ll never go back, I swear. In a small bowl, whisk together flours, gum, baking powder and baking soda. Set aside. In another small bowl, mix with your fingers together topping brown sugar, flour, salt, and cinnamon. Then work in the butter until the mixture is like coarse sand. Yum. In a medium pot on the stove, stir together canned pumpkin, cinnamon, nutmeg, cloves and ginger. On medium heat, start cooking this mixture for about 6 minutes, stirring constantly. This will reduce the metallic taste from the can and bring out even more sweetness from the pumpkin. It will also make your kitchen smell immediately like a New England October afternoon, and have you dreaming of Trick or Treaters and Hocus Pocus. Once the mixture has thickened a bit, stir in brown and white sugar and all the butter, until it’s messily combined. Remove from heat and let sit for a few minutes. Meanwhile, whisk together eggs, almond milk and vinegar. When the butter has almost entirely melted in, stir until smooth. Change to a whisk, and whisk constantly while slowly streaming in egg mixture, whisking until completely smooth. Dump the flour on top, and fold in with a spatula until almost all lumps are gone. *Walnut note. As this makes two loaves, it gives you options for what you toss in or add to it. For one loaf I toasted about 3/4 cup of walnuts, then used the majority in the bread and a few tablespoons for the topping. You could also toss in chocolate chips, dried cranberries, or whatever your dear lil’ heart desires. So if you’re adding anything into the bread, fold it in now. Divide batter between prepared pans, and sprinkle evenly with topping. Bake for 45-55 minutes (this will depend on the exact measurements of your loaf pans), turning once halfway through. Cool on rack for 20-30 minutes, then invert from loaf pans and cool completely before slicing. Well now! that really does look attractive. What a tremendous colour! 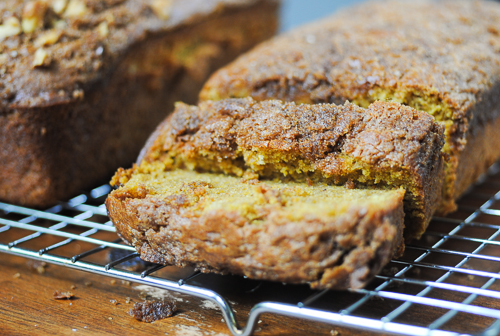 I love the idea of cooking down the pumpkin for this bread… which looks wonderful, by the way! These loaves look beautiful! The color is perfect. I’ve been reading more and more about cooking down the pumpkin purée first (to deepen flavor and remove some liquid). A simple step that makes so much difference.